Protecting your documents and data has become more important than ever before. Passwords, PIN codes and pattern unlocks are all demonstrably fallible, and though improvements have been made in fingerprint and face recognition, they're still not reliable ways of unlocking your phone. Especially if you live somewhere cold, that requires you to wear gloves, or somewhere hot that requires you to wear a burqa. 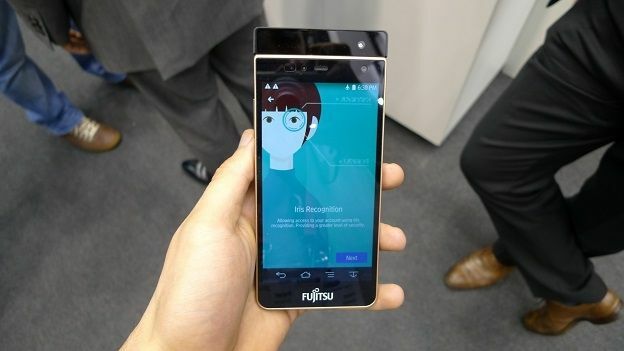 Fujitsu's idea - iris recognition - is a breath of fresh air, then, and superior in many ways to fingerprint- and face-based unlocking. Like a fingerprint, the pattern of your iris is unique, hence why movie villains have been using it, albeit unsuccesfully, to keep James Bond and the Mission Impossible team out of their underground lairs for decades now. Your eyes don't get grubby like fingers do, and though this version still has a few teething problems with people who wear glasses, Fujitsu is working out the kinks. Hold the phone up to your face, about 20cm away and the camera will scan your retinas - a process that takes around 10 seconds. Once you're scanned into the phone, your iris is recognisable by the camera within about a second. Hence, so as long as you're in front of your phone and making eye contact, the mobile will unlock and stay open. But no scanned iris, no worky. Fujitsu reckons the tech is ten times more accurate than fingerprint recognition. We're not entirely sure how they came up with that number, but we're absolutely sold on the tech. Unfortunately, Fujitsu's immediate plans are just to use it in one of its own smartphones - a phone we're unlikely to see in the UK - but we'd be surprised if it didn't wind up trying to flog it to third parties. With Chinese telecoms giant ZTE also lining up iris-scanning phones for 2015, this could be a mobile tech development to - *takes off sunglasses*- keep your eye on. Do you see?